What is the typical Atlantis guest like? What is the age range of Atlantis guests? Do I have to have a great body to fit in on Atlantis? Are women welcome on Atlantis vacations? Is it easy to connect with others on an Atlantis vacation? Which is better for me: An Atlantis Cruise or Atlantis All-Inclusive Resort vacation? I’ll be traveling alone. How does that work? 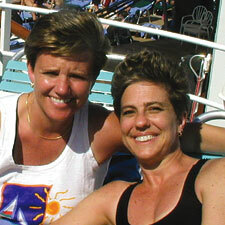 Are the staff members of the cruise lines or resorts gay-friendly? What is included in my Atlantis vacation? What is not included in my Atlantis vacation? How does Atlantis assign rooms/cabins to guests? Can Atlantis help me save on airfare? Is smoking permitted on Atlantis vacations? I have special dietary needs. How does Atlantis address this? Are there 12-step meetings on Atlantis vacations? Do I need a visa or passport? When will I receive my travel documents after booking? Does Atlantis have a monthly plan? Should I buy trip insurance? There is no typical guest on an Atlantis vacation, which is what makes the experience so much fun. Our guests range from their 20s to retirement age and beyond. They come from all over the US and all over the world. And their interests and experiences are as varied as the gay community overall. Community is what it’s all about at Atlantis, so wherever you are, you’ll feel at home. Atlantis guests range in age from their early twenties to those past retirement age. And with hundreds or thousands of guests on every Atlantis experience, you are sure to find people you feel comfortable with. Very funny. Seriously, while we have some great bodies in our brochure and website (remember it IS marketing after all), Atlantis is really all about being yourself and feeling great about who you are. Whatever shape you’re in, you’re going to feel right at home on Atlantis. We promise. Absolutely. Women have traveled on every Atlantis vacation ever produced. They typically represent between 5 and 10% of our guests, but we’re working to make that number grow. Most of our female guests are couples. Check out our page on Women & Atlantis for more information. Yes. At this time, the minimum age for our guests is 18. Guests between 18 and 21 must travel with a companion over the age of 25, staying in the same stateroom. You bet. Meeting new people is the most valued part of the Atlantis experience for most of our guests, and it’s why so many guests return again and again. Every Atlantis vacation is chock full of parties, events, and gatherings where meeting others is as easy as putting on a smile. Our cruises and resorts both offer a phenomenal vacation experience that is about community and having a fun, relaxing time. The variety of events and entertainment is what makes all Atlantis vacations special. You can’t go wrong either way. However if you really love time on the beach, want a relaxed environment, or really get into sports activities, you may prefer a Club Atlantis resort vacation. If the non-stop excitement, endless entertainment, and multiple ports of a cruise appeals to you, then join us as we set sail. Of course, you could always try both. Almost half our guests travel on their own, so we make it easy and affordable with our roommate share match program. If you would like to share a room, we will find a roommate for you at no additional charge. Roommates are assigned by smoking preference; share rooms are available in the categories listed on each program and are subject to availability. If you would like a resort room for single occupancy, we can accommodate you for a modest supplement. Cruise staterooms are subject to a 100% surcharge for single occupancy. Availability of single rooms is limited. Absolutely. We work very closely with the cruise and resort companies to insure that their staff members welcome Atlantis guests just as they do everyone else. Actually, most staff members request to work our weeks because the group is so much fun. You can rest easy. Virtually everything is included in our cruise and resort vacations: meals, entertainment, most sports with instruction, activities, parties, and tips. Our Club Atlantis vacations even include all your drinks! All Atlantis vacations include everything described on the individual tour descriptions of the website and brochure. The things that are not included in an Atlantis vacation are few and far between. Optional excursions, optional specialty restaurants, some sports, bar charges, spa services, telephone calls, and shop purchases can usually be charged to your room and settled upon departure. Reserving early gets you the best selection of rooms. Cruise staterooms are assigned at the time of booking. Resort rooms are assigned in order of reservation. We make every effort to honor special requests, subject to availability and prior requests. Atlantis uses only top-rated cruise lines and resorts, with high standards for rooms throughout. You can learn more about the specific accommodations in each price range by checking out the vacation descriptions on the website or in our brochure. We use our group buying power to offer discount air travel on flights from most cities in the United States. Our fares are usually lower than those offered on the internet, so be sure to inquire when making your reservation. Smoking is permitted only in designated areas on Atlantis cruise and resort vacations. Most of our restaurants are designated non-smoking. Our cruise lines and resorts will make every attempt to accommodate dietary needs and restrictions. Please advise us of special needs at least two weeks prior to departure. Yes. Atlantis offers a daily meeting for members of all 12-step programs. For travel to Mexico and the Caribbean, proof of citizenship is required. A valid passport is preferred, but a valid photo ID plus a certified birth certificate is acceptable for U.S. and Canadian citizens. Citizens of other countries require a passport and may require a visa. A valid passport will probably be required for travel to all other countries, and for our Hawaii cruise. Your passport should be valid for several months following your trip to avoid any potential problems. All documentation is your responsibility so please make sure that everything is in order before your departure. Your travel documents will be shipped to you or your travel agent approximately two weeks prior to departure. Delivery of documents with non-electronic airline tickets may require a signature for your protection. In addition, we make much of the pre-departure information available on the Atlantis website several weeks prior to departure. If you provide an e-mail address to us at the time of booking, we’ll send your documents and other information to you electronically (when possible). A deposit must accompany all reservations, with an additional payment due 180 days before departure for cruises and tours. Full payment is due 90 days prior to departure and for all reservations made within the 90 day period. We accept checks, Visa, MasterCard, American Express and Discover cards. Yes. Atlantis also offers a flexible payment options that lets you pay for your vacation in easy, automatic monthly payments, at no additional charge. Final payment is still required 90 days prior to departure. Our cancellation policy is detailed in our terms and conditions. For our UK and European guests, please see the UK terms and conditions. Yes. You’re spending thousands of dollars for your vacation and a few extra dollars will protect you from emergencies. Most policies offer a waiver of all pre-existing medical conditions, and cover most unexpected occurrences. There are many types of, we recommend travel insurance, we recommend some of the most comprehensive and gay friendly.